The Thing's mutated physiology grants him tremendous superhuman strength and durability. He also has enhanced stamina and lung capacity, and increased resistance to sensory and temperature extremes. His reflexes are above-average by human standarts despite his immense mass, and he retains a reasonable level of agility and dexterity. This set makes me extra-glad I didn't bother buying the Thing/Human Torch pack in TRU Series 8: he's wearing the same shade of blue as those figures, but has a much better design. This isn't just a powerhouse chest with stones painted on it, this is an all-new set of add-ons that create the biggest Minimate Thing ever: head, chest, biceps, hands, thighs and feet. The orange on his face is lighter than the new pieces, though, so it stands out a bit. All Doombots are programmed understand and counter the abilities of the Fantastic Four in combat, and to recognize all enemies of Dr Doom. Some have weapons built into their arms and they also posses tracking sensors. They can also carry shields to protect themselves from explosive burst. This is not a Doombot. Oh, it's a robot built by Doom, but that doesn't immediately make it a Doombot. Doombots are the ones that look and act exactly like Doom himself - these pink and gray things are known as "Servo-Guards," and do scut work around the castle. The Minimate has big boots, flared gloves, a belt, and a chest cap painted will all the details needed to make him look right. There's also a new headpiece that duplicates that decidedly Kirby-tastic helmet, complete with the little "ring bell for service" knob on top! He's got squinty eyes, a square nose and a grill-style mouth. 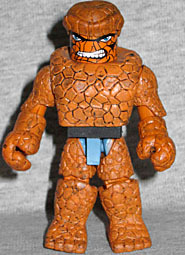 While Ben Grimm might have grown up in poverty on Yancy Street in NY, the scaly-hided strongman dubbed the Thing is a hero in every sense. Over the years the Fantastic Four's leader Mr. Fantastic, has sought to find a cure for Ben's condition. When those efforts have failed Ben has sought to hide his disfigurement from the public to avoid their looks and scorn or pity. However, it is as the Thing, Ben has found the love and respect he always sought. 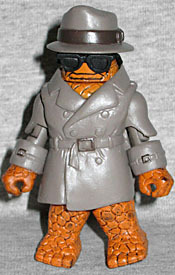 Yes, the Marvel Universe is such a weird place that an orange rock monster can effectively be disguised by wearing a trenchcoat and fedora. This variant uses the same feet as the standard release, but all the other parts are new: the hands have the lower edge of the coat sleeves attached, and while he still gets biceps/shoulder pieces, they're smooth, not rocky. The coat is sculpted, but you have to wodner how he worked the buttons and belt with his giant stone fingers. 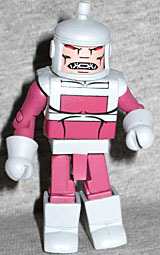 The hat and face are one piece that slide over the standard Minimate head. He includes a pair of sunglasses, but they really don't stay on his face very well at all.